Dr. Manoj Kumar Completed his LL.B. from Campus Law Centre, Faculty of Law, University of Delhi in the year 2005 and his LL.M. from Faculty of Law, University of Delhi in the year 2008. He has also completed his Ph.d. from Faculty of Law, University of Delhi in the year 2016. His research title for Ph.d. is “Role of Regulators: Constitutional and Legal Framework.” He has served as Assistant Professor in Faculty of Law, University of Delhi for around four years. He has taught various subjects like Law of Contract, Law of Partnership, Company Law, Commercial Transactions, Law of Torts, Law of Evidence, Administrative Law, Pleadings, Conveyancing and Professional Ethics etc. He has published some articles on various socio-legal issues. 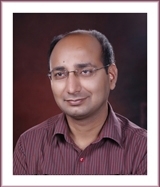 He has published some book review also and worked as member in Editorial Board of National Capital Law Journal, 2011 published by Law Centre-II, Faculty of Law, University of Delhi. He has also Participated and presented paper in various national and international seminars and conferences. He has also assisted in various administrative works. His area of research and interest is Administrative Law and Commercial Laws. Now, he has been serving in Dr. Ram Manohar Lohia National Law University, Lucknow from October, 2013.